Data manipulation Language (DML) is used to manage the schema in the database. Data Manipulation Language (DML) provides great facility to manipulate the tables in the database, we can view the database according our objective. INSERT: With the help of Insert statement we can save the data in the schema. UPDATE: This statement can have the ability to alter existing database. DELETE: This statement can delete the existing data in the database. EXPLAIN PLAIN: It can explain path to database. LOCK TABLE: This have the great ability to control concurrency in the database. Data definition Language (DDL) has the ability to define the structure of the schema. CREATE: It can create a new table schema in the database. ALTER: This statement can alter object in the schema. TRUNCATE: This statement can delete the data from the database including log files. COMMENT: It have the ability create comment to data dictionary. RENAME: This statement have the ability to rename the objects in the database. 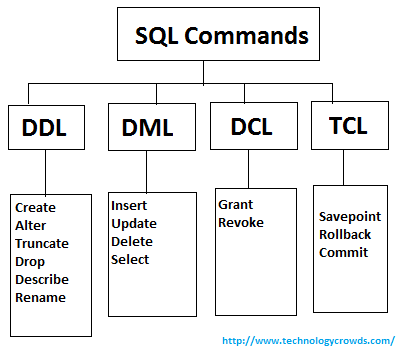 Data Control Language (DCL) statements. Below have provided some examples of DCL. GRANT: It has the ability to provide privileges to the user. REVOKE: This statement have the facility to remove privileges provided by GRANT. Transaction Control Statements (TCL) is used to handle the changes done by Data manipulation language. COMMIT: This statement have the ability to commit data. SAVEPOINT: This statement identifies point where we can roll back later. ROLLBACK: This statement can done changes in the object to earlier state. SET TRANSACTION: This statement can control the changes in the objects, we can commit or rollback objects as per the query requirement.